The U.S., home to just five percent of the world population, holds 25% of the world’s prison population. There are 2.3 million people in the nation’s prisons and jails—a 500% increase in the past 40 years. The land of the free is the incarceration capital of the world. Auburn Seminary, Ebenezer Baptist Church, The Temple, and other interfaith partners are collaborating on a national initiative to catalyze a faith-rooted response to mass incarceration. The initiative leverages the spiritual power, people power, and other resources in faith communities toward ongoing efforts on ending mass incarceration in America, and will convene a national conference on June 17-19, 2019 in Atlanta. Ebenezer Baptist Church raised $50,000 to free 10 people held in pretrial detentions. 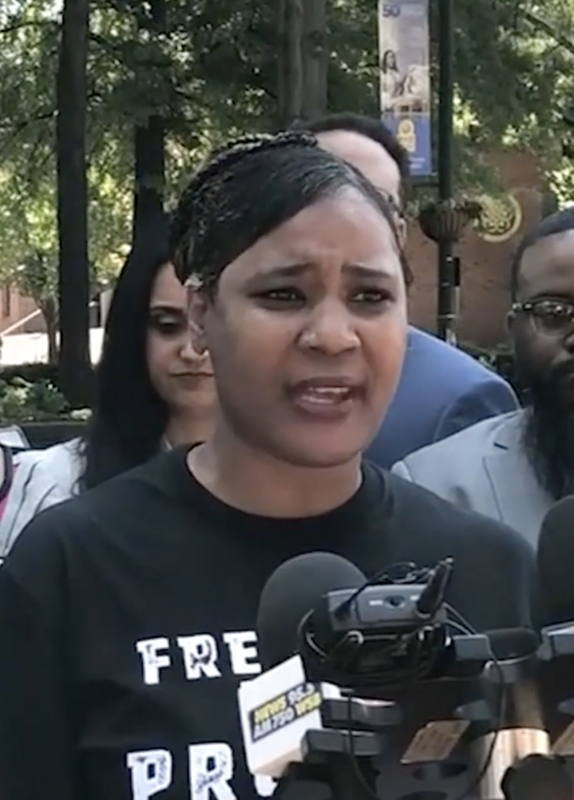 LaQuanda Smith was among those freed. Who we are locking up. While racial bias plays a key role, excessive sentencing laws and widespread socioeconomic inequality are also part of this complex problem. The cash bail system penalizes those without wealth, crowding jails with people who exist on the margins of the economy, lacking access to education and jobs. The result is a system that incarcerates people simply for being poor. Even after the trauma and stigmatization of incarceration, former inmates face penalties including discrimination in housing and employment, the inability to vote, and exclusion from public benefits, student loans, and some professional licenses. Those who serve time in America’s prisons—or plead guilty in exchange for little or no actual prison time—face continued stigmas and compounded challenges as they are legally barred from full citizenship. Convene, train, and equip faith leaders and their communities with practical tools to work locally, including learning about the “sealing” or “erasing” the legal record of an arrest or a criminal conviction, known as an expungement, the cash bail system as unjust and unfair, and promoting restorative justice practices. Identify and organize around a strategic legislative agenda at local, state, and national levels. Develop a strategy for reframing public understanding of mass incarceration and the prison industrial complex and its vast implications for public safety, quality of life, and other societal interests through a faith-rooted lens. Organize a national, multifaith network of partners focused on abolishing mass incarceration. Momentum Phase (through June 2019): planning for the June 2019 conference, laying the groundwork for implementation, and identifying partners for the post-conference advocacy work that will include the adoption of municipal, state, and national policies and practices that make use of alternatives to incarceration. Implementation Phase (June 2019 through May 30, 2023): training and resource sharing to enhance the efficacy of faith leaders in mobilizing support within their communities to mount a determined and broadly visible resistance to the prison industrial complex and, in particular, the disproportionate impact of mass incarceration on people of color and poor people. The multifaith community is uniquely positioned to draw upon ancient traditions, moral vocabulary, and the institutional strength of collective witness to address the depth of this human rights catastrophe. So far this has not happened, even in the Black church. Although there are ministries and congregational efforts supporting those who are presently or formerly incarcerated, religious communities have yet to speak in a clear theological voice about the systems that perpetuate mass incarceration, and to organize an effective moral witness against the laws, policies, and policing practices that contribute to its continuing evolution. On June 19 and 20, 2018, 60 leaders from faith-rooted and secular organizations convened for an education and strategy session at Ebenezer Baptist Church, rooted in the voices of those directly impacted. We are committed to ensuring such leadership is at the center of all strategy development and implementation to end mass incarceration. Auburn Seminary, Ebenezer Baptist Church, The Temple, and other interfaith partners are collaborating on a national initiative to leverage the spiritual power, people power, and resources in faith communities toward ongoing efforts on catalyze a faith-rooted response to ending mass incarceration. The initiative leverages the spiritual power, people power, and other resources in faith communities toward ongoing efforts on ending mass incarceration in America, and will convene a national conference on June 17-19, 2019 in Atlanta. Auburn, led by The Rev. Dr. Katharine Rhodes Henderson, is a center for leadership development and research with 200 years of experience supporting and equipping faith-rooted justice leaders to catalyze change. Ebenezer Baptist Church, led by Senior Pastor The Rev. Dr. Raphael G. Warnock, is the spiritual home of The Reverend Dr. Martin Luther King, Jr. Before coming to “America’s Freedom Church,” Dr. Warnock was blessed to serve in leading congregations also known for their deep spiritual roots and strong public witness. Under his leadership, more than 4,000 new members have joined the church’s congregation, enhancing its legacy of social activism. The Temple, led by Senior Rabbi Peter Berg, heeds the prophetic call for tikkun olam (repairing the world), through the Rothschild Social Justice Institute, working on change at the local level and beyond on issues including Jewish-Muslim Relations, Racial Justice, and much more. The list of partners is growing and we invite you, your organization, and your faith community joining this initiative! If you would like to support this critical work, please contact The Rev. John Vaughn, Executive Vice President at Auburn, via his colleague, Mimi Rivera [email protected].